Home » Articles - ICBC » Motorcycle accidents and ICBC. Unlike automobile accidents, motorcycle accident victims often have severe injuries to arms and legs, including loss of a limb. We recognize that motorcyclists are often deemed by witnesses to be driving at a higher speed than accurate. 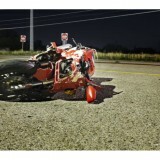 Further, we are aware that the general public often assumes the motorcyclist is at-fault. What Factors Does ICBC Consider in Determining Fault and Damages? whether or not you were wearing appropriate safety devices (i.e. a certified helmet and protective clothing, including appropriate footwear). As with a car accident, evidence from witnesses and the accident scene are key in determining liability. An accident reconstruction expert may need to be retained, preferably one well-versed in collisions between motorcycles and other vehicles, objects or pedestrians. We regularly work with accident reconstruction engineers and specialists in our practice. At Fishman Lawyers representing vehicle accident victims and disabled people is what we do. An experienced motorcycle accident lawyer in Vancouver can help you get the damages to which you are entitled.